The market opened in 1907, a year or two after this ‘Then’ photo was taken, in an area to the south, where middlemen operated. They were known as ‘sharks’ by farmers and grocers. The view here is looking east on Marion Street, across Western Avenue, and we estimate the Webster and Stevens Studio photographer snapped our “Then” photo in 1905 or 1906. The top four floors of the Colman Building, the six-story brick block, right of center, were completed in 1905. Facing First Avenue, the Colman survives, extending the full block between Marion and Columbia streets. It was James Colman, one of Seattle’s best-known pioneers not named Denny, who built his namesake landmark. The brilliant engineer and Scottish immigrant is also honored with a park on Lake Washington Boulevard and Colman Dock, the long wharf that has been the center for Puget Sound transportation since the late 19th century. The dock is directly behind and over the right shoulder of the photographer. Here the nine tracks of Railroad Avenue separated the Colman Dock and the West Seattle Ferry Dock from the photographer and the bustling business of Marion Street. The four-story stone building on the right, the Colman Annex, is separated from the Colman Building by Post Avenue, which on some old city maps is called a street and on others an alley. This “Colman Annex” was constructed of East Coast stone. 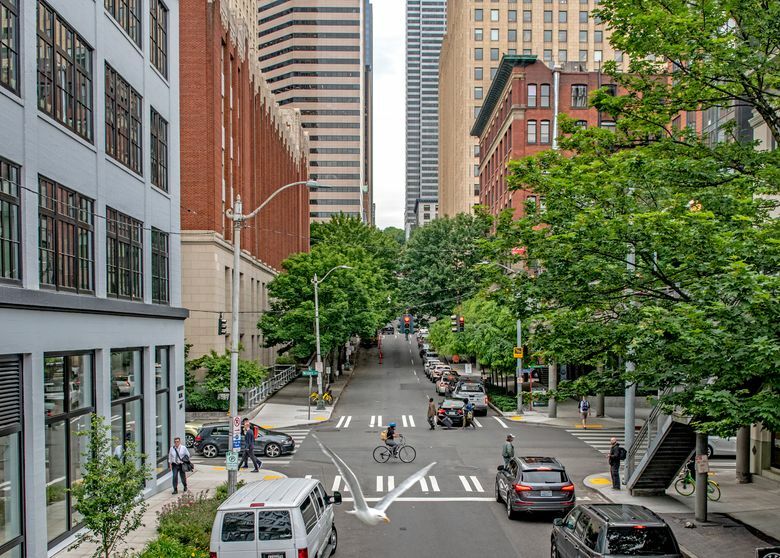 It was a lucky break for Colman: When the federal postmaster rejected its delivery — the stone was decreed too soft for the construction of Seattle’s main post office at Third Avenue and Union Street — Colman purchased the lot for pennies on the dollar. Many locals will best remember it as the longtime home for Society Candies. More recently a parking lot, the Colman Annex block is now filled by a high-rise that celebrates its location as The Post Building. It can be glimpsed through the leaves, upper-right, in our “Now” photo. The wagons this side of Western most likely have something to do with the delivery of produce. This is the Commission District, developed near both the railroads and the “Mosquito Fleet” steamers that carried fresh fruits and vegetables to the district’s large and generally homely warehouses. They were run by middlemen who were best known as “the sharks” by the farmers who sold to them and grocers who bought from them. 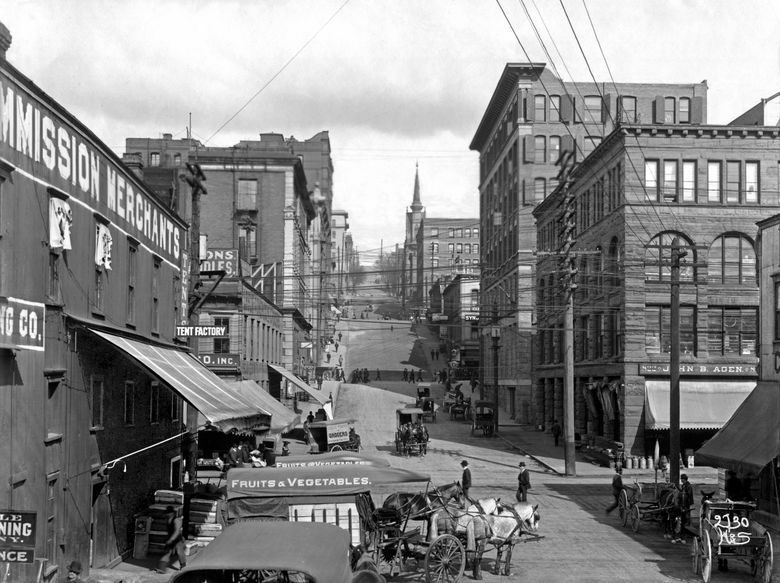 This was the gouging “Western Avenue combine” that truck farmers, homeowners and a progressive city council soon opposed in 1907 with a go-around, Pike Place Public Market.